Radio has never been more exciting. The internet and podcasting - and the increase in use of smartphones and tablets - seem to have opened up the world of radio rather than shutting it down. In fact, according to the latest figures from Radio Joint Audience Research (RAJAR), 89% of the UK population tune in to radio each week. In 2016, RAJAR reported that 48 million adults were listening to just over a billion hours of radio each week - a new high. During one quarter in that year, a massive 170 new local and national digital stations were launched. No wonder then, that some of you will be thinking about starting your own station this year, or improving one you’ve already set up. But, where to begin? James Browning started out in music organising parties and drum’n’bass raves in South East London as a teen, going on to have a show on Resonance Radio when he was just 18 years old, and put on events and shadowed people hosting radio shows while at university in Brighton. Years later he decided to find his way back to music and set up his own project - Balamii. 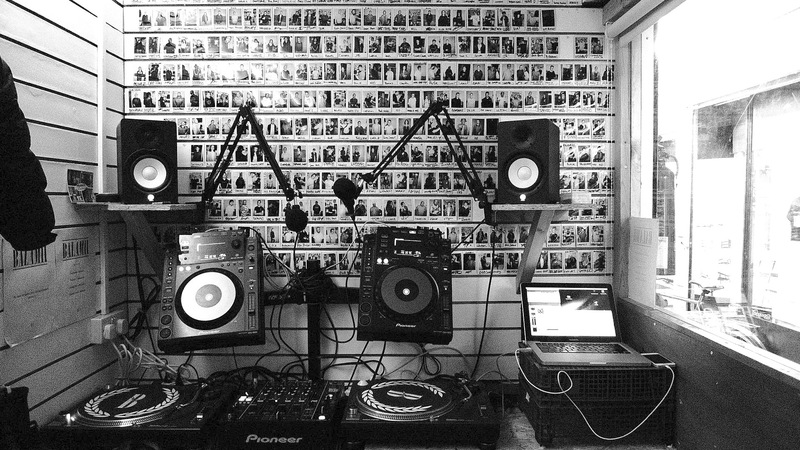 At first it was a app only platform, allowing people to listen to mixes James recorded in clubs, but soon this developed into a radio station, operating from a small, hand built studio in Peckham. Balamii’s scope is far from low-scale though. James has built something unique and vital -giving platform to emerging artists alongside more established ones, as well as regular shows to creatives like BBZ, a collective prioritising the experiences of queer women, trans and non binary people of colour. He’s also launched an arm in New York, as well as holding regular dances and even a live jazz series at nearby Dulwich Pavilion. Here are his top tips for anyone wanting to set up their own station. What’s the biggest piece of practical advice you could give to someone about to set up a station? Try to learn as much as you can yourself - relying on other people isn't an option unless you have money. Youtube and Google will be your best friend here. I had no idea how to build a website and app, and link it all up to the station. The great thing is all the answers are out there on the internet - you just have to find it. Unfortunately this means A LOT of time spent down dead ends and frustrating work-arounds. However, once you've done this yourself you'll know your station and how it works inside out, so if there are ever any problems they're fixed quickly. Also send yourself on courses to learn Photoshop and InDesign - having some graphic design knowledge is gonna help a lot, as well as making sure what you're doing looks nice on the socials. What is the most important piece of advice you could give about the day-to-day running of a station? Running the station day to day is all about consistency. Nothing will happen overnight unless you're lucky. As long as you can bang out shows to a high level of quality all the time, you'll be fine. How important is the ‘branding’ side of starting a station? Branding is very, very important - it's what people want to associate with. More people watch online radio these days than listen to it, if you know what I mean, so the visual stuff is key. What do you wish you’d known before you started and why? If I'd known what I was doing I'd have saved a lot of time. But really figuring this out and earning it has been the journey, and I wouldn't change it. One thing I would say though, is don't do it by yourself! Do it with some people that can help, chip in, bounce ideas off. Doing it solo was hard. Is there anything else you think would be useful for someone to know if they're setting up a station? In the beginning I went out to record people playing in clubs live then put those recordings up onto the app. At this point there was no station, studio, website, live feed…anything. It was only an app that delivered mixes I had recorded. But through doing this, I met a lot of people who in turn came to the studio when it was built. I also asked friends to come through, and then met friends of friends, and from there it's grown. It's been very organic and taken a long time. Also email out asking DJs who are in town if they'd like to come on and play - once you have a few people do that, then more and more will fall into place. Launching in November, Foundation FM is a female-led station, looking to give platform to voices less represented on the airwaves. It’s steered by a diverse group of women, LGTBQI+ persons and talented creatives, with women at the forefront. Founders Ami Bennett, Becky Richardson and Frankie Wells come from backgrounds in radio promotions, artist management and radio production working with the likes of Radio 1, 1Xtra, Asian Network and Capital Xtra. With their connections to UK underground culture, nightlife, labels, personalities and collectives, they want their station to provide a platform that enhances the scene and nurtures talent with one big difference: an inclusive focus. Having just gone through the complex process of setting up and launching their station, the Foundation founders are in a great position to give you some first-hand advice about doing it yourself. Here are their top tips. What do you wish you’d known before you started setting up Foundation FM? Frankie: This sounds strange but how to get online and on air. I know it sounds silly but it is the most important thing and I guess until we had the studio built - which took a little time - I didn’t really know the full ins and out of it. Now it seems easy, it’s all set up and we use the software everyday (shout out to Radio Co - I really recommend it) but there are quite a few factors. You have to do your research, finding out what licensing works best for you, what playout program is compatible with your software, if the tech works with it all, how to keep the production at a certain level - they all feed into one another. Luckily there are loads of tech Youtube videos and also so many people who were so helpful in getting us on air and teaching me. Big thank you to them! I don’t know how we would’ve done it without the knowledge and help of so many other people. Frankie: Always ask. There’s no shame in it and I genuinely believe there is no such thing as a stupid question. I can’t tell you how many times I’ve been on the phone to either licensing company or our tech spec… literally everyone…asking the tiniest questions and making sure I’ve got it right. It’s made all the difference. And people are always willing to help! What is the biggest piece of practical advice you could give to someone about to set up a station? Ami: Check and double-check everything! And get people on side who know their stuff practically and technically. We were really lucky to have amazing help on our website and with our studio build. There will always be things that get forgotten about, but if you have a great team, you’ll get it sorted. The three of us have different skill sets, and the people around us have all been hugely supportive (and tolerant at times!). Try to think logically, and work in order of urgency. And try to stay focused in meetings (I really struggle with this!) - I think we found that the hardest when there was so much going on, it was sometimes easy to get distracted by the things that felt easier or quicker to sort out and tick off our lists! Becky: Really important - especially in the early stages when people are deciding whether to tune in or buy a t-shirt. They have to get a feel for the station and what we are about from our socials and visual brand identity, through the website and social media! What is the most important piece of advice you could give someone for the weeks after launching? Ami: I think as well it’s about being patient, and not being too hard on yourself. Like with anything, there’s a settling in period, and inevitably some things will not always go to plan. And I think that is advice I’d give to presenters as well as anyone who is launching something new like this! Founded by DJ and label-owner Gilles Peterson in 2016, East London-based Worldwide FM focuses on underground music, culture and stories from around the globe, with off-shoots in Berlin, Kyoto, Los Angeles, Paris, Rio and Tokyo. The music on offer is consistently eclectic and of high quality, in engaging formats. The Coconut Beats show, for example, explores psychedelic sounds from around the globe with each episode focusing on a specific country or region, spotlighting emerging artists from each place. Each week the Classic Album Sundays show delves deep into iconic records, while top notch residencies and hosts keep the quality of selections at the highest grade: Channel One – one of the most the most iconic dub crews and influential sound systems in the world – for example, have a monthly residency with two hours of solid dub and roots classics, and Tina Edwards with her WW Daily show. Worldwide also throws parties and events - such as Q&As - bringing its quality music ethos into the real world, and has been part of the rise of UK jazz, with its links to Brownswood Recordings and artists and organisations in the scene. Here station manager Dan Moss tells us what it takes to run a great radio station. What’s the most important piece of advice you could give about the day-to-day running of a station? Stay focused on your identity and purpose. What’s different and appealing about your station? You’ll have to juggle a million little things on a daily basis so remembering to keep this at the front of your mind is key. There’s now a pretty broad range of independent broadcasters, radio stations and streaming start-ups out there, all of whom have had to find solutions to issues with licensing, technology, staffing… it’s a friendly community and people are happy to impart advice, so seek it out proactively. Who are the key people/roles you need to have in place to operate a station? We have a distinctive set of DJs and broadcasters who are enthusiastic about Worldwide FM, and that’s clearly a really important starting point. Behind the scenes, in a small team like ours, everyone gets stuck in and while we have specific roles, inevitably what we do overlaps a bit to make everything work. We have a technical production manager, George, who engineers our technical setup and is constantly looking at ways to improve how we broadcast; Mari and Sam work together to programme and produce a packed and varied schedule with regular and one-off shows; Thris Tian is our Head Of Music and so oversees the tone and balance of the station; Gilles Peterson, the station’s founder, advises on editorial focus and is a creative force behind much of what we do; Ceylan manages our website and social media output; Brian is our designer and he continues to develop our visual aesthetic across our platforms; Nicole is our Production Assistant who looks after the live studio and show archive. Even outside of that core production team and our presenters, there are a number of people around the world making sure that shows happen each week. How do you go about putting together a programme and roster of DJs? We have programming meetings as a team and discuss potential tweaks to the schedule and editorial themes we want to cover from week to week. We are lucky in that our team have had strong relationships with some of the longstanding international broadcasters on Worldwide FM for a long time, which creates an amazing foundation for us to build from. Often the best editorial ideas come from our DJs themselves and once we have activated the Worldwide FM hive-mind, it’s really exciting watching the seed take root and helping bring some of the ideas to life. We’re conscious not to over-extend ourselves with our schedule - our ambition is to give every show the attention and support it deserves. The starting point for us is always compelling radio programming but maintaining consistency and identity across different platforms is really important to us. From streams and images to t-shirts, we try to communicate the Worldwide FM aesthetic in different ways. One thing that has been really rewarding is working with different designers who are extended members of the Worldwide family - for instance, Victoria Topping, On The Corner’s Art Director, designed our latest t-shirt and we have more collaborations planned for 2019. Find a location that won’t upset the neighbours!